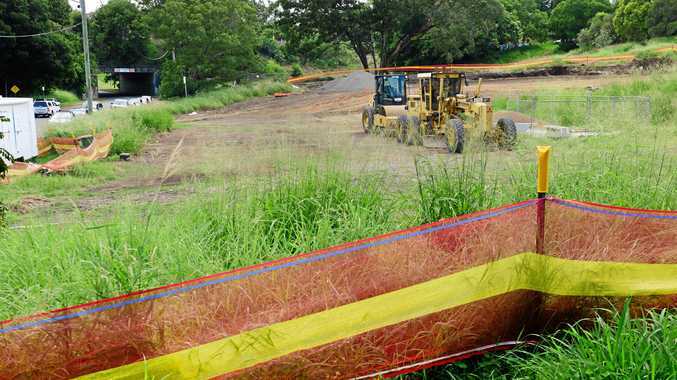 LESS than six months out from the hotly contested Ekka Pump-King competition, three local families are busy planting their crops in preparation. Among them are veteran farmer and Ekka Legend Syd Haag and the neighbouring Fritz and Frohloff families. RNA Chief Executive Brendan Christou said the giant pumpkin competition dated back to the very first show in 1876. "This is one of our most iconic agricultural competitions, recognising and rewarding growers for producing the best of the best," he said. There's $1000 up for grabs for the Heaviest Pumpkin of Show. Primary school students will get real world learning, with the competition planting the seed (literally) about the importance of agriculture and the critical role it plays in our everyday lives. The nine month science experiment is perfect for Prep to year four and will allow them to nurture and observe how living things grow, change and use the earth's resources - and the results will be huge. The gargantuan gourds will roll onto the Plaza at the Brisbane Showgrounds in May 2019 for judging, with the competition held outside of the August Ekka to take advantage of premium pumpkin growing season. Entries are now open for the 2019 Royal Queensland Show (Ekka) Giant Pumpkin Competition. The competition is open to all green thumbs who think they're destined for big things, including farmers, youths and amateur gardeners. For proactive pumpkin producers, free Giant Atlantic pumpkin seeds and an information pack are now available by emailing entries@royalqueenslandshow.com.au. Entries close 5pm, Friday April 26, 2019, but it's best to plant the seeds by the end of December 2018, as the portly pumpkins take around four and a half months to mature. Here's the Ipswich, Lockyer and Scenic Rim's top three Pump-King contenders. Syd Haag the Pumpkin Man: Syd Haag tells us a bit more about his pumpkins. 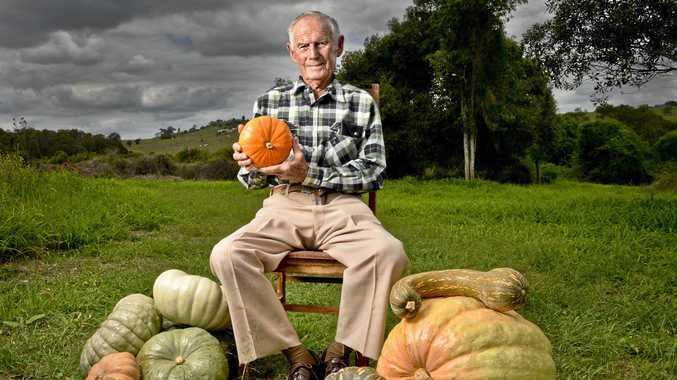 NEXT year will be the 61st time Boonah farmer Syd Haag enters the coveted Ekka Giant Pumpkin Competition and, all things going well, the 30th time he takes out the title. 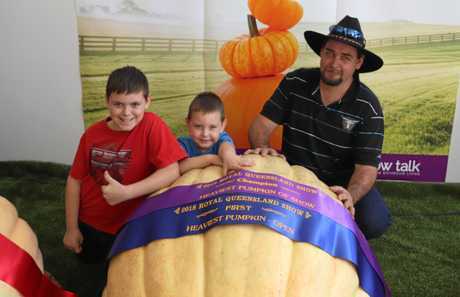 The biggest pumpkin Mr Haag lugged to the Ekka was 260kg but he submits up to four for each of the six categories. Mr Haag grows more than 30 kinds of pumpkins, including his own Haag's Special, and Desert Table pumpkins, Queensland Blue, Ironbark, Jarrahdale, Windsor Black, Bugle and pear-shaped, paw-paw, Japanese flap, crown prince, red butternut and even a pumpkin specifically grown from Gramma Pie. The 86-year-old farmer has been tending to his eclectic 70 acre crops, which also includes four kinds of peanuts, for more than 30 years. In 2015, the well-known and respected farmer was named the Ekka Legend. "My favourite recipe is using dessert pumpkins to make scones. "I have about 30 different varieties of pumpkins but it's only the big cattle pumpkins that take more than one person. All the others one person can handle," he said. "Haag's Special I have bred myself." 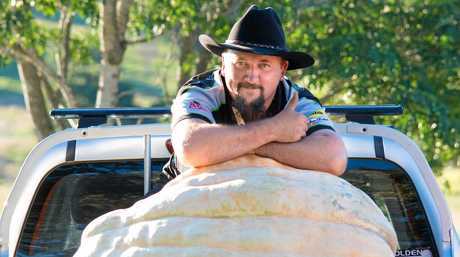 NEWCOMER Steven Fritz blitzed the competition earlier this year, with his larger than life pumpkin weighing in at a whopping 206kg and squashing previous pump-kings and father and son, Geoff and Tony Frohloff. Steven claimed the coveted Champion Heaviest Pumpkin of Show, with his gigantic veggie ending Minden father and son Geoff and Tony Frohloff's four year winning streak. 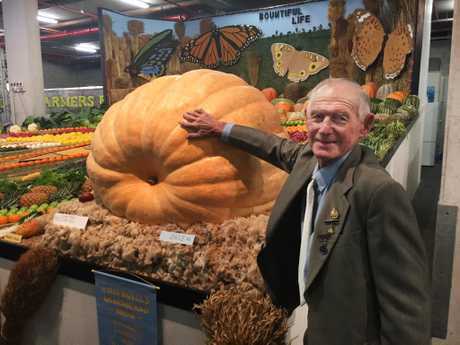 Mr Fritz said this year's competition was his first time growing a giant pumpkin and he was thrilled to beat his neighbours in some friendly competition. "I live near the Frohloff family and they've actually been giving me lots of tips and advice - they probably gave me too much advice, but thank you to them," he said. "It's my first time growing anything for a competition so I didn't expect my pumpkin to get so big. I think the good soil in the Marburg area helped and also lots of water and fertilisers." GIANT pumpkins are a family affair for the Frohloffs. 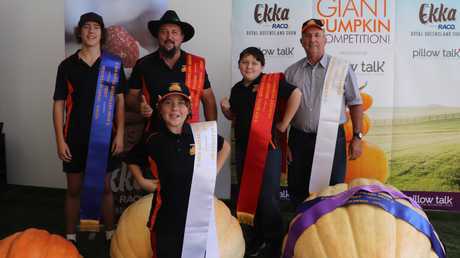 Tony Frohloff claimed second place in the Heaviest Pumpkin of the Show class at the 2018 Ekka with a 140kg whopper, while his Dad Geoff, who still holds the 261.5kg Ekka record set in 2015, came third with a pumpkin weighing 135.5kg. Tony's son Jordan won Youth Class with his 61.5kg pumpkin while second place went to Dylan Frohloff with his 36.5kg veggie and third to Riley Frohloff's 24.5kg pumpkin. Who has the best sausage in Ipswich?